Wanting to make some small amount of a water soluble neodymium salt from a neodymium (Nd2Fe14B) magnet according to the 'German method' (http://www.versuchschemie.de/topic,9178,0,-Neodym%28III%29-s...) I ran into unforeseen and rather strange problems. The magnet, 45.4 g, was first thermally demagnetised, stripped (partially) of it's Ni cover, broken up into a few chunks and attempted to dissolve into 100 mL water + 100 mL 50 % H2SO4 (these are very much the ratios used by the versuchschemie experimenter 'Bariumnitrat', adjusted for magnet quantity). I need to specify that my 50 % H2SO4 is in fact toilet cleaner and is slightly contaminated with Fe3+, if not other things. I met with problems dissolving the magnet which I may elaborate on later on. Having a short fuse patience wise I switched to 32 % HCl as a solvent and used about 350 mL to achieve full dissolution of the magnet although much of the Ni cover was found back undissolved and removed from the solution, now a greenish colour mainly from Fe2+. I wanted to exploit the inverted solubility/temperature curve of Nd2(SO4)3 like the 'Bariunnitrat' did, so I needed to convert the chlorides to sulphates. I guess I could have tried to saturate the solution with Na2SO4 or (NH4)2SO4 and hoped the Nd sulphate would precipitate out at higher temperature but I didn't fancy the multitude of spectator cations in a saturated solution. So I went all the way by neutralising a diluted solution of the chlorides with strong NaOH, filtering and washing the precipitate and redissolving it in H2SO4. By now, due to exposure to air oxygen much of the Fe had gone to Fe [+III] and the precipitate was a mixture of ferric hydroxide, hematite and Nd(OH)3.n H2O. 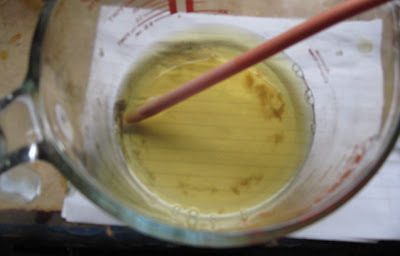 A little water was added to the precipitate slurry to improve stirrability and then gradually 100 mL of 50 % H2SO4 was added, under constant stirring. Much heat was generated and most of the precipitate dissolved into a yellow solution with an off white precipitate forming. By then the solution was about 95 C, so the precipitate (which I need to add wasn't lavender coloured at all) seemed consistent with Nd2(SO4)2 having dropped out at high temperature. The stuff settled really well and was washed by means of decanting off boiling water several times and then dried at 130 C for about 2 hours. About 15 g was the weight. A light salmon pink, dry, sandy solid was obtained, still not lavender at all. And it isn't Nd2(SO4)3 at all, I believe. For one it's neither soluble in hot or cold water. A hydroxy sulphate? Nd(OH)SO4? (Nd(OH)2)2SO4? Something like that? In 32 % HCl there was some solubility of this product but not much, resulting in the supernatant liquid to take on a greenish-yellow, the colour of NdCl(H2O)7 (2+) perhaps? This liquid was decanted off and set aside. Testing a small amount by adding strong NaOH caused a lavenderish gel like precipitate to form: Nd(OH)3.n H2O? 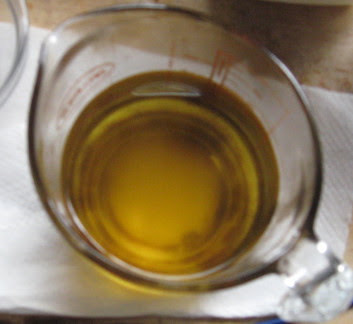 The insoluble part was then (after washing) subjected to 100 mL of 50 % H2SO4 into which it dissolved effortlessly and spontaneously. But on adding water for dilution a white precipitate formed again, leaving a clear supernatant liquid! This suspension was cooled down to about 7 C but id didn't dissolve (as you'd expect Nd2(SO4)3 to do). Washed again, another 100 mL H2SO4 was added, this time the precipitate only dissolved with stirring and heating: by about 80 C all had dissolved and the solution was lavender coloured again. This time I cooled it down to about 5 C and added water in the form of ice (the temperature never exceeded 17 C): but to no avail; a white precipitate formed in a clear supernatant liquid. Further cooling did not dissolve it. The low temperature at which the precipitation occurred indicates it's really hydrolysis that's causing the problem. That's how far I've gotten now. I'm certainly using far more H2SO4 than is strictly necessary: I believe the amount of Nd in the precipitate to be about 0.08 mol, tops. That would requite about 0.15 mol H2SO4 to convert to Nd2(SO4)3, or 15 g H2SO4, or 30 mL 50 % H2SO4. So, I'll try and see what happens using far less H2SO4, perhaps starting with 20 m 50 % H2SO4 + 20 mL water. Alternatively I could try HNO3 of which I have 30something %. Anyone has any ideas as to what is the white, clearly sulphate and Nd based compound might be? That might explain the initial problems I had with dissolving the magnet into 25 % H2SO4: hot H2SO4 is still strong enough to carbonise polymeric materials. Twice the reaction started briskly, then halted abruptly after about 5 mins. Only a few gram had dissolved. That's why I switched to HCl. What is the boron becoming in this process? Curious as I did not see any mention of it or its reactions in this experiment whether the acid used was sulfuric or hydrochloric. The boron present will not react with any non-oxidizing acid. Under extreme conditions it may be oxidized by HNO3, though. Seems to me I've observed a tan colored precipitate around Fe(III) sulfate. Insoluble, dissolves slowly in H2SO4. It seems to be a compound of Fe (what else would it be? ), but it's not nearly as yellow as most Fe(III) compounds are. 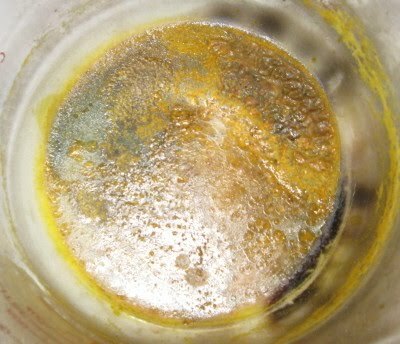 To check if your magnet contain only Nd, not Nd+Pr mixture you should take a sample and precipitate lanthanides as oxalates. All Fe(II) should be converted to Fe(III) first. Recrystalize it from hot 50% HNO3 and burn to oxide. If oxide is white blue ( may be a little grey) - you have only Nd in your magnet. If oxide is brown, you have Nd+Pr. Another test: pure Nd oxalte is bright violet under tungsten lamp and white under fluorescent lamp. Pr contaminated oxalate is also bright violet under tungsten lamp but bright green under fluorescent lamp. I believe that when I redissolved the hydroxides, the separation between Nd and Fe was complete. It's the only way to explain why when I do get the Nd based precipitate to dissolve it dissolves into a neat lavender solution, presumably Nd2(SO4)3 only. Believe me kmno4, if I had oxalic acid I'd have used the oxalate separation route, alas I have none. I don't believe this magnet contained any appreciable amount of Pr: see the precipitate obtained from the chloride (that bit of the mysterious precipitate that did dissolve in strong HCl); that hydroxide was whitish-lavender, not brown. Do you have any evidence for your last assertion? Because the latest 'version' of the sulphate based precipitate was obtained in cold conditions I've a gut feeling it might be more soluble. Today I'll try dissolving it in a smaller quantity of about 25 % H2SO4. My instinct tells me too high sulphate ion concentration is somehow causing the problem. Is praseodymium a useful additive in NdFeB magnet compositions? I did a cursory web search and didn't turn up anything about that. Is it just left in because it's more trouble than it's worth to separate the praseodymium? So it precipitates? What if you add H2O2 to the acid? Treatment with less concentrated H2SO4 and later with 38 % HNO3 yielded nothing. It must be said though that the product is scarcely soluble but not completely insoluble: every time I treat some of the supernatant liquid with strong alkali a small amount of whitish precipitate forms. I'm beginning to think that rather than a basic sulphate it's something akin to a bisulphate that may be causing the problem here. ... should be possible because of the insolubility of the hydroxide. The precipitate was boiled up for 15 mins with 5 M NaOH and is now standing overnight. If I'm right the washed precipitate should dissolve irreversibly in strong HCl. I know some bonding methods use epoxy type materials. I wonder if you would do better if you grind the magnets to powder first. Smashing them with a hammer first, then grinding to powder. Seems like a small ball mill with the right choice of grinding material would turn it into powder. I also did not believe in Pr contamination. 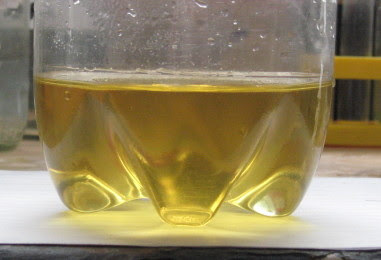 Brown oxide and green colour of solution (in fluorescent light). Brown colour is very strong evidence of Pr contamination according to literature. Of course, precipitated hydroxides are of lavenda colour, but very light green under fluorescent lamp. If you do not see this colours - you are lucky and have magnet without Pr. Smart people , probably from China noticed that it is not worth to lose time (weeks and months in extractive methods) to separate Nd - Pr because Nd can be partially replaced with Pr in magnets. Pair Nd-Pr is not easy to separate. In the past this mixture were called "didymium"
In the late 1920s, Leo Moser recombined praseodymium and neodymium in a 1:1 ratio to create his "Heliolite" glass, which has color-changing properties between amber, reddish, and green depending on the light source. In the Nd2Fe14B magnets, surplus 4s and 3d electrons from the Fe enter the vacant 4f orbitals in Nd (which has only 3 4f electrons of its own), to provide the maximum number possible of unpaired electrons in 3d and 4f orbitals. Pr and Ce could also do this job, but less effectively due to their lesser nuclear charges and having fewer 4f electrons of their own. Because Nd is an even-numbered element, it is likely to be more abundant than Pr. Uranium-238 (depleted U), which is the homolog of neodymium, and of which there are huge stockpiles sitting around in storage as the byproduct of uranium enrichment (in fissionable U-235) just waiting for uses to be found, could theoretically serve as a substitute for Nd. However, this has not yet been explored by magnet makers for hard drives. Although U has the same numbers of 5f electrons and vacant 5f orbitals as Nd has 4f electrons and orbitals, because U is more electropositive than Nd (in fact able to form hexavalent compounds) the surplus 4s and 3d electrons from Fe may not enter its 5f orbitals to the same extent. Pr may possibly be chemically separated somehow from Nd through its forming, with strong oxidation, the tetravalent compounds Pr6O11 and PrF4, not formed by Nd, but there are no water-soluble Pr(IV) compounds, unlike Ce(IV). "In its compounds, praseodymium occurs in oxidation states +2, +3 and/or +4. Praseodymium(IV) is a strong oxidant, instantly oxidizing water to elemental oxygen (O2), or hydrochloric acid to elemental chlorine. Thus, in aqueous solution, only the +3 oxidation state is encountered. Praseodymium(III) salts are yellow-green and, in solution, present a fairly simple absorption spectrum in the visible region, with a band in the yellow-orange at 589-590 nm (which coincides with the sodium emission doublet), and three bands in the blue/violet region, at 444, 468, and 482 nm, approximately. These positions vary slightly with the counter-ion. Praseodymium oxide, as obtained by the ignition of salts such as the oxalate or carbonate in air, is essentially black in color (with a hint of brown or green) and contains +3 and +4 praseodymium in a somewhat variable ratio, depending upon the conditions of formation. Its formula is conventionally rendered as Pr6O11." As it so happens, the first time I treated the mysterious precipitate with 32 % HCl (by adding 100 mL and boiling in, then repeating this another 2 times) I obtained a yellow-green solution. I'm sure it contains no Fe3+: it precipitates from NaOH as a grayish hydroxide, so that could be Pr3+. I will try and convert it to carbonate and fire it. Is it possible that inadvertently this procedure leached out the Pr? 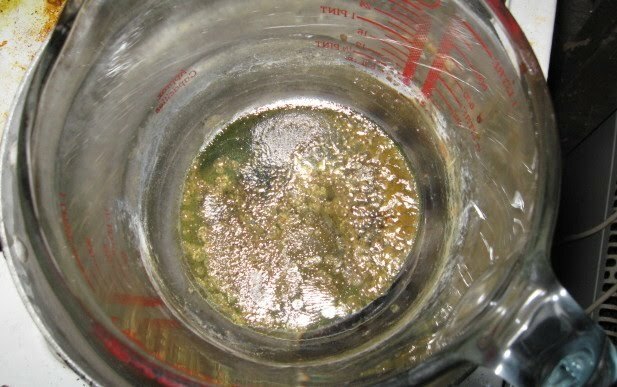 Subsequent leachings with HCl didn't yield a yellow green solution at all. The displacement product dissolved effortlessly in strong HCl, after decanting off the alkaline supernatant liquid. 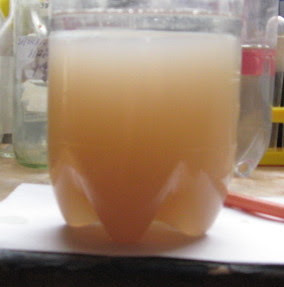 I now have three solutions of NdCl3 in HCl to neutralise, to recover reasonably pure NdCl3.6 H2O. This solution was then reduced in volume, first in direct flame, then au bain marie. This is what left. Despite the rubbish reflection, patches of green can be seen, next to red/amber. This cannot be Fe2+, or Nd3+ but PrCl3 would fit the bill, as kmno4 suggests. Due to beaker breakage the investigation into the presence of Pr had to be abandoned (evidence lost!). Shame. 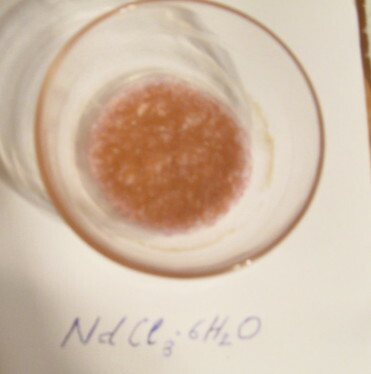 NdCl3.6 H2O (photo distorts colour), after dissolving Nd(OH)3 in HCl, crystallizing, washing with acetone and drying. Predictably perhaps, when viewed under a 'saver bulb' it takes on a decidedly greenish hue! Precipitate the iron and neodymium as their hydroxides and wash carefully. Use sulphuric acid to separate the two, based on the sulphate method outlined high up in this thread? I precipitated the hydroxides with NaOH and filtered the mud. It is dark green and forms a brown layer on the surface. If I treat this with sulfuric acid, won't the neodymium also go in solution? Or is it just that Nd sulfate is so insoluble that most of it will precipitate? I figured after I precipitated the hydroxides, that I could've just used the chloride solution. Wiki says in the NdCl3 article that its melting point is 758C without decomposition. So I thought I could've just boiled down the chloride solution, and keep heating until all the fecl3 decomposes to insoluble iron (hydr)oxides and HCl, and then a wash and filtering should give me a pretty pure NdCl3 solution, right? However the same article says that the hydrate does decompose NdCl3 + H2O → NdOCl + 2 HCl what is the truth? Is this NdOCl insoluble? The classic separation of iron is to oxidise it to Fe+++ then add lots of HCl and extract it with ether. That's only useful f you have ether, but if you do it's the easy way to do it. The other simple way is to add a little NaOH slowly to the solution of the chlorides. The Fe+++ will ppt first and leave the Nd in solution. I wouldn’t do that: I think you’ll end up with a goo. Also, FeCl3 is quite resistant to hydrolysis, as long as there’s acid left. 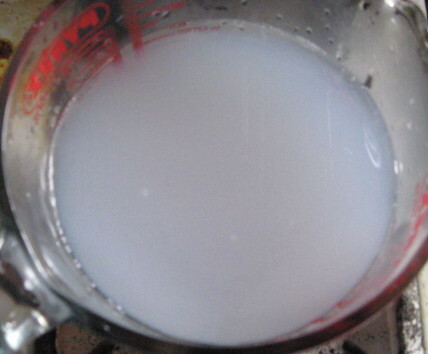 Apart from ether, FeCl3 is also very soluble in acetone. But these extractions aren’t as easy as that when there’s LOTS of iron present. You need to grind your chloride mix quite finely too. I see solvent extraction more as a last purification, to get the last minute bits of iron out of your product.